Preheat oven to 400 degrees. In a medium-sized bowl, mix ground beef, parsley, chili powder, red pepper flakes, garlic, shallot, and salt and pepper. Once combined, add wet ingredients to bowl, then add panko breadcrumbs. Mixture should be wet, yet tacky. Adjust the amount of breadcrumbs in order to get the right consistency. Roll the mixture into 1-inch balls and place on a greased baking sheet. Bake at 400 degrees for 18-22 minutes or until browned on the outside and cooked through. Drain fat from the sheet and transfer the meatballs into a saucepan over medium heat. 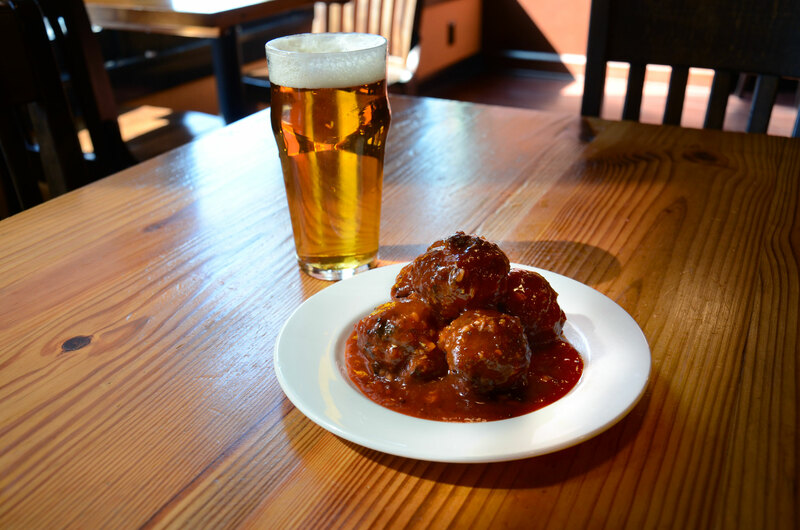 Cover the meatballs with BBQ sauce, adding the remaining Dortmunder Gold Lager to thin out the sauce. Simmer for 7-10 minutes. Serve with toothpicks.